As lame as this sounds, there’s simply not enough positive things that can be said about this book. So instead, I’ll give a few warnings. This book is a slow burner. You’ll be nearly a hundred pages in before you really have an inkling as to what the plot is about, and from there, the pacing doesn’t really quicken much. But that’s okay! It’s something that really works in the favor of the book. If you can’t handle open minded discussion of religions and gods, then this book is not for you. However, it masterfully and respectfully hands many mythologies and ties them into a cohesive, satisfying, engaging story that’s well worth the time it will take you to read it. Now that all that’s out of the way, let’s talk about some of the aspects, good and bad, about the book. I’ve seen some criticisms of the book that say it never reaches the full potential of its premise. I disagree with that. Much of the book is dedicated to the wrangling together of all the gods, which is exactly what the book says it’s gonna be about. The climax is satisfying in a somewhat unexpected way. But the clues are dropped throughout the book. It’s not a climax that comes out of left field. Characters remain in character, and, for me, it ends in a wholly satisfying way. That’s not to say the book doesn’t have some issues. Primarily in Part 2. The whole Lakeside arc is kind of useless, in the broad context of the story. Everything kind of comes to a halt. Yeah, some of the chapters deal with Shadow and Wednesday continuing to recruit gods who will be important to the finale, but that could’ve been accomplished in a chapter of two, instead of the five or so that end up being in that part. And they’re lengthy chapters, too. Most of what happens in Lakeside has no real impact on the rest of the story. It’s truly a B-plot line. Which is fine, but I think it’s a reason why people find the book overly long and meandering and disappointing. It really does feel like everything just takes a break for Shadow to do some fun small-town shenanigans. There’s some fun character development that happens, and I’m not saying the entire part is useless, but it’s definitely somewhat superfluous. If one were to shorten the book, they could easily start with the Lakeside plotline. In the Author’s Preferred Edition, there’s a cut scene involving a conversation between Shadow and Jesus Christ. I understand why it was cut, that Gaiman felt it hinted at something he couldn’t provide in the restraints of this particular novel, but I wish it had been kept in the actual novel (not as an apocryphal scene) because I think it touches on some of the interesting themes of the later half of the book, where it’s emphasized that the gods essentially have different forms of themselves depending on who’s worshiping them. That’s really interesting, and I wish that conversation had been kept in the chapter it was originally supposed to be in. It’s a short scene, after all. But I get why it was cut. I really enjoy how the book ends. The last few chapters are just gripping. Really all of Part 3 is fantastic. The way Gaiman jumps from different points of view as everyone finds their way to Rock City is a masterclass in creating tension. We’ll see something happen from one point of view, and then see the events that led to that thing happening, etc. It really makes it so that you don’t want to put down the book. At all. 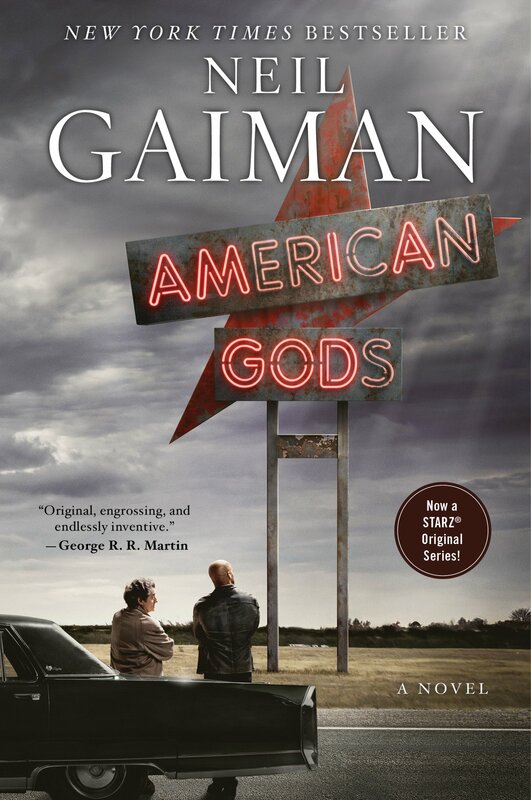 Overall, I enjoyed American Gods even more the second time I read it. It’s fascinating, gripping, epic, moving, and most of all entertaining. There’s a reason it’s as beloved as it is. I’m outrageously excited for the STARZ adaptation of it because so much of this book is vividly visual that it’ll be exciting to see it realized on TV. If you like Gaiman, like fantasy, like theology, or just like a good story, I recommend you read this book immediately.